As Brora golf club enters its 127th year, there are many reasons why the golf club has been so successful. The golf course design is recognised as being one of James Braid’s finest pieces of work. The green staff work tirelessly to preserve the original design whilst presenting a course that is regularly acclaimed for its quality. The perfect balance between challenge and fun and in a breath-taking setting. Our recently upgraded clubhouse provides a spectacular view of the golf course and surrounding links land and our trained staff are on hand to make your visit to Brora golf club smooth and enjoyable. Refreshments are available from the bar; food is available from the restaurant and our Pro shop will take care of all your golfing needs. One of my favourite links is Brora on the Moray Firth, where the golfers share a precious piece of territory with a hundred or so woolly sheep. What could epitomise nature better than such a communion? I pray it will continue and last as long as the world. Brora was a wonderful links golf course. I had a very difficult time with it. I’d like to play it again. I’d like to challenge it again. But it was very good. One of the finest Links Courses in the Highlands, one of Braid's Finest. A challenging course, with a stunning backdrop and a welcome that was second to none- - we will be back! 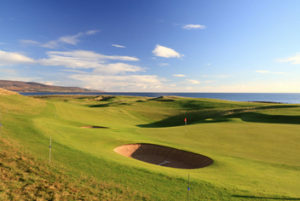 The Brora Golf Course was one of our favorites in Scotland. The day we visited it was not busy at all and we were able to play at a steady pace. The course is alongside the sea and the views are gorgeous. The terrain was challenging and hilly. The course is the home of the James Braid Society and recommended by Peter Thompson (5 open championships) as one of the best links in the world. He is not wrong. The course is truly stunning - dont let the short looking card fool you - try and break your handicap.